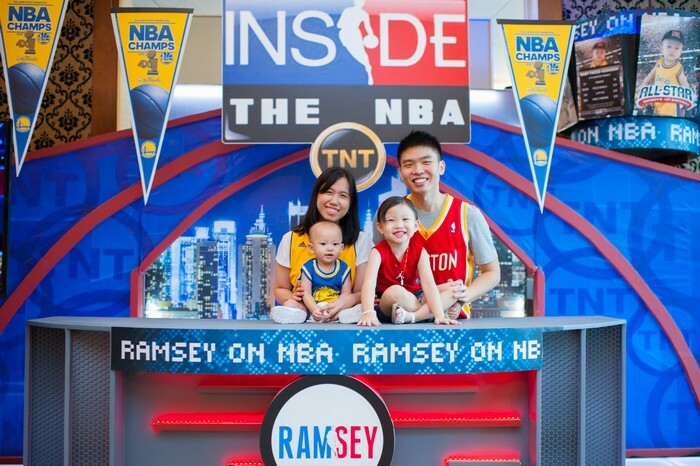 Inside The NBA at Ramsey’s 1st! I am a huge, huge fan of totally unique parties. As our past clients know, Party Magic (the event styling boutique I manage) is well known for its “no-two-parties-are-alike policy“. In other words, even though we do parties week-in and week-out, every party is special. This isn’t a policy as much as a natural inclination on my part. I just like the whole process of creation and doings for the first time, every time. And besides, things get boring after you repeat them for the nth time! Once in a while though, a request comes up that literally knocks me out cold! 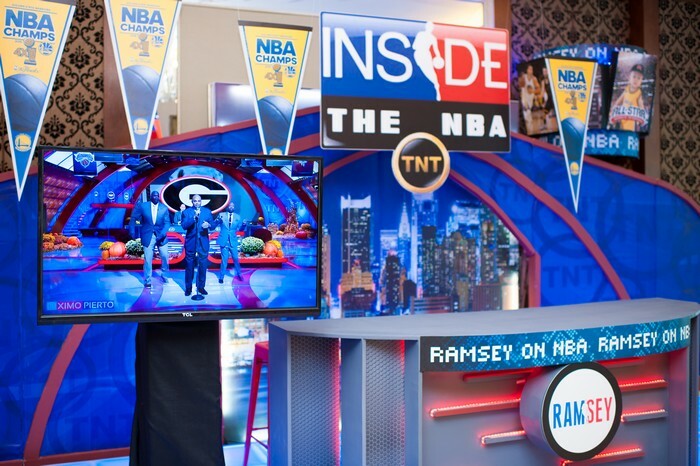 The client, my friend Eleanore, wanted her son Ramsey’s birthday to be patterned after famous TV show Inside The NBA. (Eleanore’s firstborn, Eloise, threw a slumber-themed party at St. Francis right here). 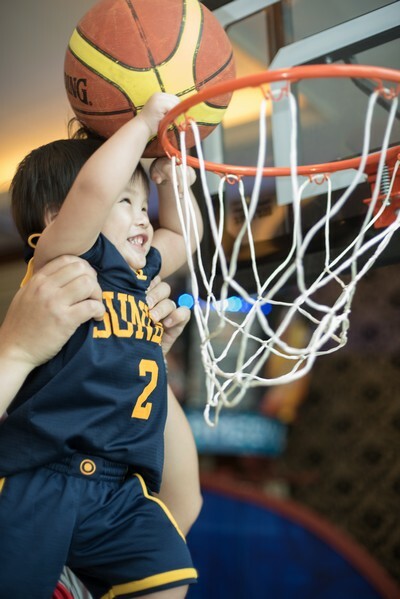 She is a true blue NBA fan, and so is her husband! Now this was a true mind-blower. After sitting this down with my hubby, though, we managed to come up with a suitable plan of execution. 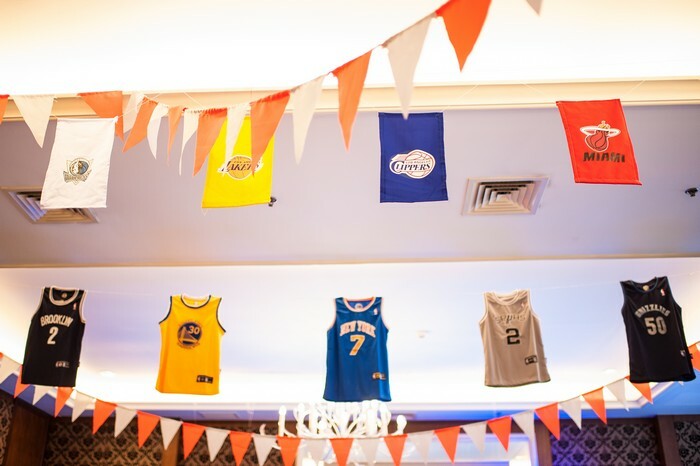 Everything (and I mean, literally everything) was customized for this party. A bonus was that the stage set-up turned out very photogenic! Instead of the typical block letters (which I honestly am beginning to get tired of), I opted for a stylized Ramsey lettering designed in the cast of the classic NBA logo. So cute right! 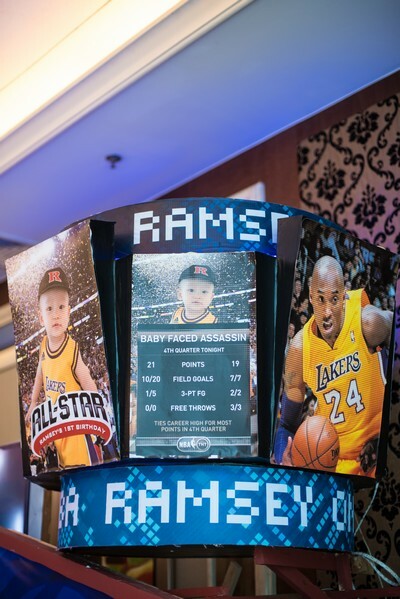 We made this sort of circular scoreboard, featuring Ramsey in a Lakers jersey beside Kobe Bryant. Ramsey took on Stephen Curry’s moniker, aptly named the Baby-Faced Assassin, complete with stats! Rawr! The ceiling was a bit tricky. St. Francis has a reputation for being quite stringent with the ingress/egress of the suppliers (they are almost as tough as Rockwell condos), as well as to what types of decor you are allowed to hang on the ceiling, where to hang it, what do you need to use to hang it, etc. 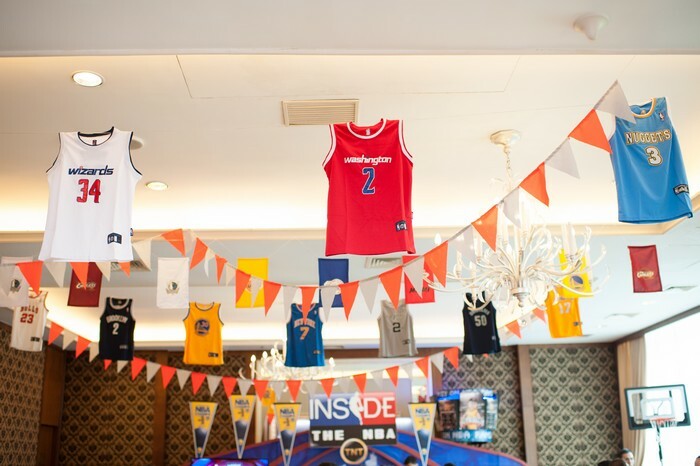 So I decided that instead of the typical swags, lanterns, pompoms, we opted for banderitas (orange and white), banners with NBA team logos imprinted, and NBA jerseys! All in all, I think we put up around 150 jerseys and banners combined! One reason why I always look forward to Eleanore’s parties though, is because of the feel of her parties. It was just the right balance between festiveness and intimacy that I really like. And I think this was achieved because of a number of factors: the venue, the decor, the program/entertainment, and (of course) the guests! Daddy-daughter killer combo. Go for gold! A young Jordan plying his trade! 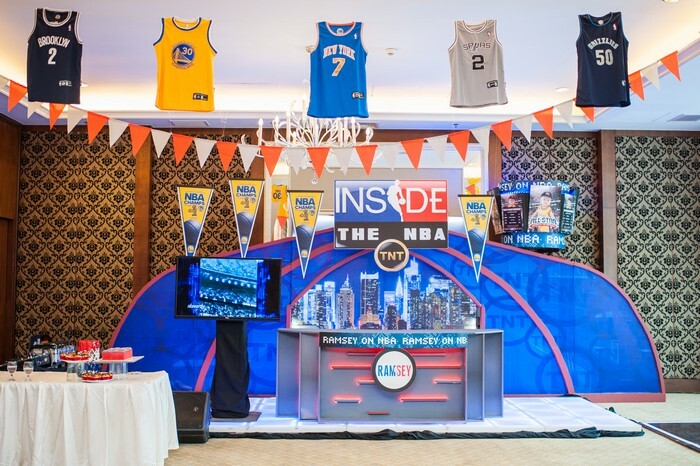 As you might have noticed with the photos, the guests were all-in with the theme. And that’s why there’s that 4th factor I mentioned: no matter how nice your venue or your decor and program is, it really won’t matter if the guests are not game! I like the guy on the right. He really knows where his loyalties lie. 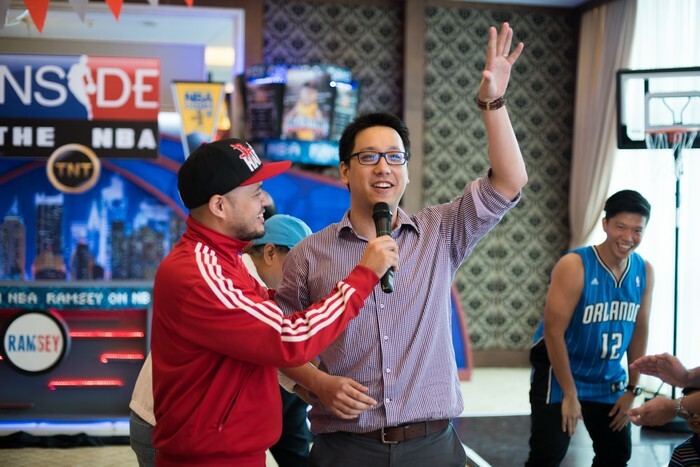 Go Gilas! Watch out for Jumbo (was that written on his jersey?) the Destroyer!! 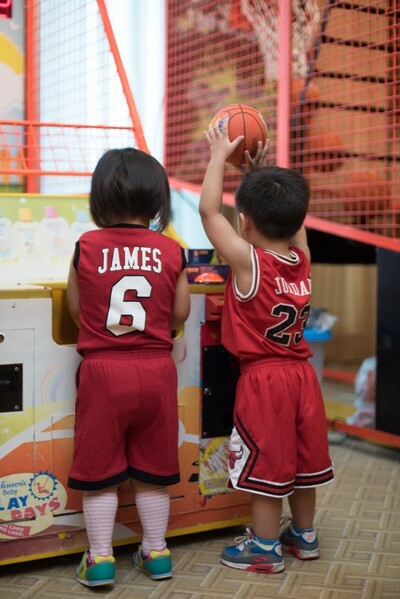 James vs Jordan: who is really the greatest? The guests provided the warmth. Simple as that. Courtside Seats at Stephen’s NBA All-Star Party!